Solar Art installed a wall mural in Irvine, California to a conference room. The customer was looking for a design piece as well as dry erase film for the space. They wanted to be able to easily write on the wall during meetings and not have an ugly board in the room that takes up space. They worked with our in house design team to come up with the perfect custom graphic for them! We installed two different wall graphics. We first installed the custom graphic of the brick background to the wall. This created a design piece that was modern and clean. We then installed the Solyx dry erase film on top. 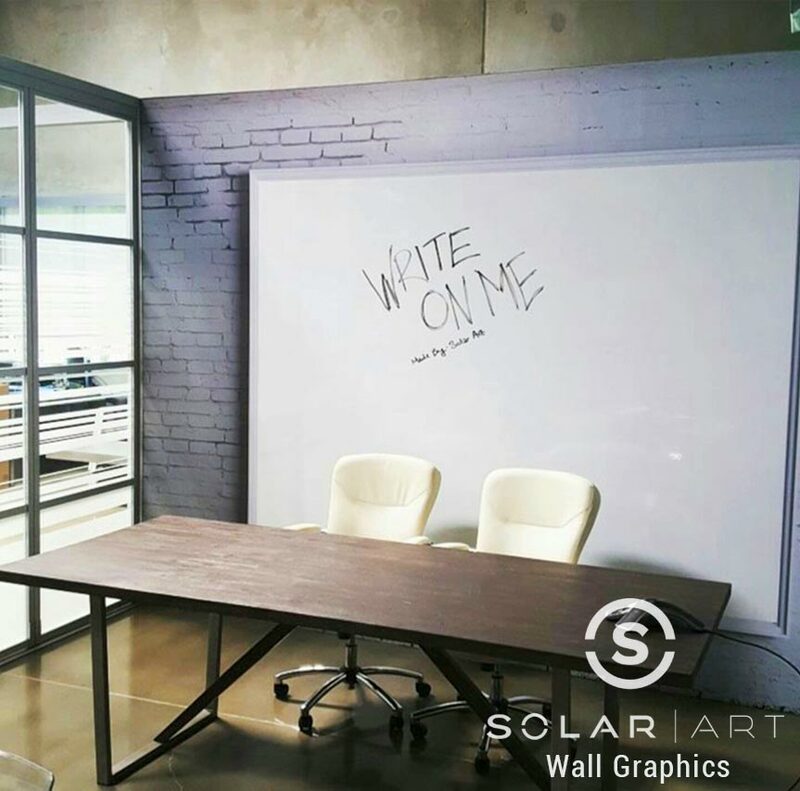 Solyx dry erase film can be applied to both windows and walls, depending on the purpose and what you are looking for. If you are wanting the dry erase film to be installed to walls (SX-2095), there is only a white window film option. If you are wanting it installed to windows, you have a few more options. You can get white dry erase for glass, dry erase mist (SX-2020), clear dry erase (SX-2080) and more. Check out Solyx’s website to see the full list of options! In both cases, dry erase film like wall graphics and window graphics are easily removable with no damage to the surface if done properly. Like solar film, anti graffiti film and security window film, if applied to windows, graphics can reduce heat and reduce glare as well as block 99% of UVA and UVB rays.This particular installation was done in an office setting, but Solar Art has also installed wall graphics, window graphics and dry erase film to homes as well. Wall murals look great in backyards, kids rooms and game rooms. Dry erase film also looks great in kids rooms, home offices and even the kitchen. It can be an easy and cost effective learning tool for your children or simply a place for daily reminders! No matter the location or the setting, dry erase film and custom graphics can provide several benefits! Contact us directly to talk about wall murals and custom graphics! With custom graphics and wall murals you have the flexibility to create whatever you want! Whether it is dry erase film for an office conference room or wall graphics for a home game room, the options are endless! Contact Solar Art to learn more!